With a new magic moment in his amazing career, Ronnie O’Sullivan made a 147 to complete a 9-3 win over Ding Junhui in the BetVictor 伟德 Welsh Open final. O’Sullivan sealed victory in the perfect fashion, potting 15 reds with blacks and clearing the colours in the last frame. He even potted the last black left-handed to complete a demonstration of pure genius. It’s the 12th 147 of his career, beating the record of 11 he had held jointly with Stephen Hendry. The break was worth £12,000 to go with the £60,000 he collected for winning his first ranking title of the season. It’s the 105th maximum in snooker history and O’Sullivan’s first since 2011. O’Sullivan won the 26th ranking title of his career, moving him ahead of John Higgins on the all-time list and just two behind Steve Davis’ total of 28, though still ten behind Hendry’s record of 36. The 38-year-old from Chigwell’s did the bulk of the damage in the first session, surging 7-1 ahead as China’s Ding made a host of uncharacteristic errors. And O’Sullivan added the two frames he needed, bringing a 1,100-strong crowd at the Newport Centre to their feet with a grandstand finish. O’Sullivan has played in 12 tournaments this season and has now won four of those, having previously captured the Paul Hunter Classic, Champion of Champions and the Masters, all non-ranking events. It’s his third Welsh Open title and rarely can any player have won a tournament so convincingly; he conceded just ten frames in seven matches (winning 36) and never looked in danger of defeat. O’Sullivan is the first British winner of a ranking event this season, with the previous titles shared between Ding, Neil Robertson and Marco Fu. Once again, a tournament that started with 128 players in the first round finished with two of the best in the final. 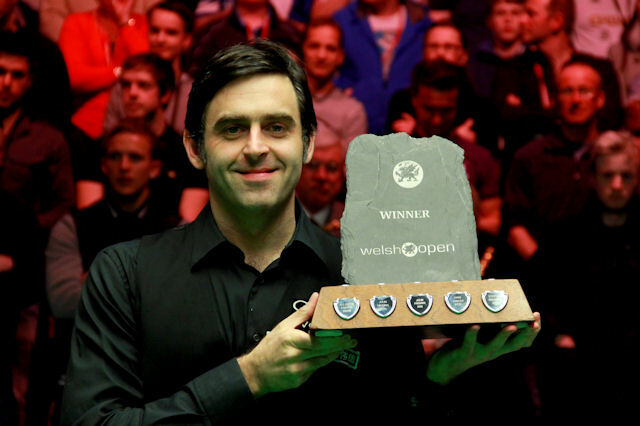 O’Sullivan and Ding – alongside Robertson – have been the best in the world this season. Having won four ranking titles this season, Ding missed out on the chance to equal Hendry’s record of five, set in 1990/91. The Sheffield-based cueman has been remarkably consistent in recent months and had won 39 out of 41 ranking event matches before today, but was unable to improve that record after getting off to a poor start. O’Sullivan made top breaks of 91, 70 and 92 in the first session as he opened up a six-frame advantage. Ding got off to the perfect start in the evening as back-to-back centuries, 109 and 121, raised his hopes of a fight-back. In frame 11, O’Sullivan led 56-0 when he ran out of position, and a loose safety gave Ding a chance. But he made just 13, and O’Sullivan got back in to add 49 for 8-3. And the contest was soon over thanks to the Rocket’s electric finish, as he compiled the 147 in seven minutes, 31 seconds. O’Sullivan said: “I wasn’t really going for it. I was trying to score as many points as I could to get over the line. It wasn’t until I got to 48 and the balls broke lovely that I thought it was on, but I was more concerned with winning the frame. I was still playing shots to win the frame until I got to 72, then I thought I can get the maximum. The fans deserve it – they have supported this tournament brilliantly over the years. In front of a crowd like this it is a great experience. It’s a nice record, to have 12 maximums. I suppose a little bit of me wanted to take one of Hendry’s records. “I played a really good match, he missed a few shots early on. I pounced in the first few frames and was scoring heavily. After that I lost my concentration a bit and was losing position, but I won a lot of the close frames which was important. Anyone that comes back at you, especially of Ding’s quality, you have to take it seriously. I have learnt how to cope with my emotions and knew I had to keep calm. I hadn’t done a lot wrong so I couldn’t be too hard on myself. Ding said: “I know I wasn’t in my best form and had a lot of mistakes today. Ronnie punished me straight away when I missed easy shots and he was scoring very heavily. I never thought that the game was finished and kept trying. At 7-3 I had a chance but I didn’t take it. It was great to play Ronnie in the final. He can make a 147 any time he wants. I thought it was possible from the first black. I just like people enjoying the game. People love to watch Ronnie play – he is fast and attacking.